First off, I have been on a major blogging break these past few weeks. Lots of things going on, (good things! ), but I've been missing my blog friends (thanks for your emails, tweets, and texts! ), and I also wanted to share with you a boutique I recently discovered. Bluetique has many locations....I visited the one in downtown Raleigh (near NC State's campus), and just loved everything I saw in there. I'm a big fan of skirts, so I knew this one would be a perfect addition to my summer, and really, year-round, collection. How has the beginning of your summer been?! I hope you're having a great week so far! Holy cow this skirt is amazing! I love a new boutique find - and since I'm almost out of maternity clothes I think it's time for a little shopping spree! You look fabulous! I kept wondering!! Glad everything is going well! You look grest! Yay!! Welcome back. 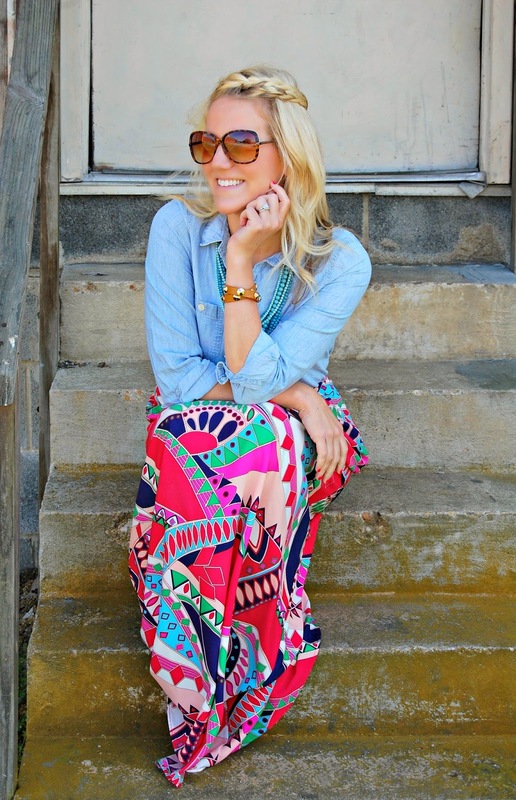 Love the look & Bluetique-they have such great, affordable pieces! So glad to see a little update from you today! That skirt is GOOORGEOUS! I love the fun, bright print! Glad you are doing ok! That is a great skirt. Love the skirt you look gorgeous! I think I like every single maxi you post. But this one...this one is at the top of the list. Beautiful! Helloo!!! I have been checking your blog every day :) :) So glad you're back! That skirt is so you, Ashley. I love it! We need to get together again soon! Glad you're back and everything is well :) The print on that maxi skirt is just beautiful! 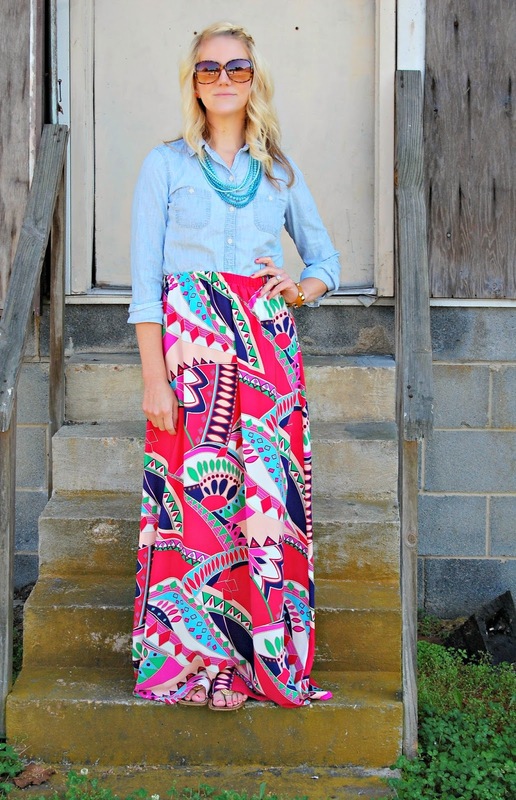 I just love the colors and print of that skirt and love your braid! yeah for a little blogging break - i think i need one :) and I LOVE this skirt! Your braid is making me swoon! So perfect!! We've missed you!! Hope all is well! :) LOVE this outfit! That skirt is beautiful! Love how you paired it with the chambray too! Nice to see your smiling face! That skirt is pretty amazing! Love all the color, it's a "happy" pattern! This is such a cute skirt!! I love the bright colors! Oh Ashley! Your outfits are always my favorite :) This maxi is so "you!" I love the bright colors. :) Stunning as always! I was wondering where you where! Glad things are going well and that skirt is amazing! You look beautiful as always! That skirt is all kinds of gorgeousness! I'm obsessed!! I hope you're having an amazing summer so far! Such a cute skirt! I love the whole outfit! That skirt is GORGEOUS! We missed you! This skirt looks so amazing on you. Such a cute skirt! The colors are fantastic! Glad you're back! Love this skirt! This skirt is SO pretty! I love that first picture of you too. This skirt is beautiful and I love the colors! Our summer has gotten off to a rainy start. Loving your skirt. cutest outfit! you look so great in those bright colors!